PASADENA, Calif. — Since Opportunity celebrated her 12th anniversary on Mars back on the night of Jan. 24, our tenacious rover and science team have been occupied exploring the environs of Knudsen Ridge. This geological formation comprises the southern wall of Marathon Valley, which is located along the western rim of Endeavour Crater. It also has kept Opportunity, the team who operates her, and myself, very busy. Knudsen Ridge is named after Jens Martin Knudsen (1930-2005) who was a member of our Mars Exploration Rover Athena Science Team. With it being around the time of the Easter holiday, Opportunity has been in the spirit while exploring Knudsen Ridge in search of her own version of colored eggs in the form of water altered zones of bedrock. The prime reason for our investigations of this ridge is because we are interested in the “red zones” located along numerous joints and fractures in the outcrop located here. We think that these zones are indications of rocks that have been chemically altered by the action of water in the past. However, accessing these regions thus far has proven to be an unattainable goal due to extremely high slopes that we have encountered. 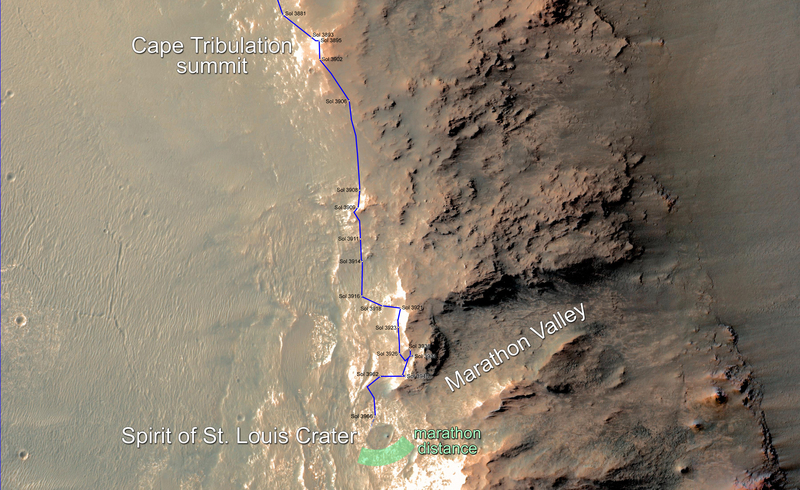 These high slopes caused Opportunity to undergo excessive slippage. But there’s a positive side to this as these slopes have also contributed to a much higher solar input from the panels, increasing our power to 598 watt-hours. For instance, on Sol 4311 Opportunity reached a high tilt of just over 32 degrees. This severe tilt caused the team a lot of difficulty in getting the IDD (our instrument-laden arm) to our desired targets located uphill. After numerous gallant attempts and a great deal of detailed discussions among the team, we decided to move on towards other targets that will not present as many obstacles. We decided to back down the hill and then drive westward in search of more favorably placed “red zones”. Our initial drive downhill caused considerable churning up of the soil and gave us a lower tilt of about 25 degrees. Images acquired of these churned up regions showed very colorful (red, brown, and white) materials, which appeared to be the altered materials that we were after further up the slope. Unfortunately, the terrain here still precluded our ability to place the IDD on them and collect elemental composition. Also on Sol 4311, I discovered a dust devil out on the floor of Endeavour Crater. This was the first dust devil that we have seen since way back on Sol 3182, in January of 2013. Dust devils are relatively rare in Meridiani Planum, Opportunity has only seen 6 dust devils while exploring the Red Planet in just over a period of 12 years. We are continuing to collect useful data by conducting productive scientific campaigns on various targets even while avoiding the use of Opportunity’s flash memory. In what we call RAM (Random Access Memory) mode, the only data received back on Earth is what we can transmit each sol before the rover shuts down for its overnight sleep period. This forces us to do all of our science activities and engineering data within a contiguous block of time in our downlink pass. Opportunity drove just over 30 meters in 4 drives during this period and has a total odometry (as of the Sol 4323 drive) count of 42.69 kilometers (26.53 miles). Dr. Jim W. Rice, Jr., is an Astrogeologist at the Planetary Science Institute, he has over 25 years research experience specializing on the surface geology and history of water on Mars. Dr. Rice is currently a Co-Investigator and Geology Team Leader on the Mars Exploration Rover Project (Spirit and Opportunity). Rice also has extensive mission experience as Associate Project Scientist on the Lunar Reconnaissance Orbiter and Mars Odyssey Orbiter Projects. He has been involved in Mars landing site selection and certification activities for every NASA Mars Mission since Mars Pathfinder. His career includes working for NASA, Astrogeology Headquarters of the United States Geological Survey, the Mars Spaceflight Facility located at Arizona State University and the Lunar and Planetary Laboratory located at the University of Arizona.